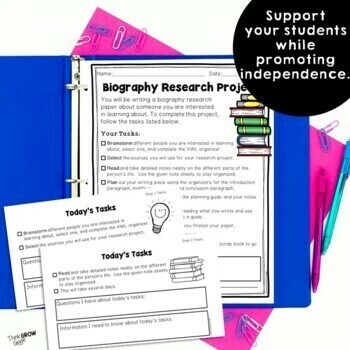 This biography research report project is broken down step by step, with templates to help your students write a research project independently. 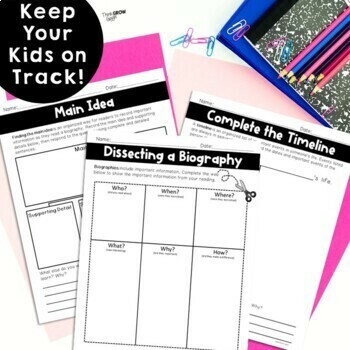 Templates, graphic organizers, and clearly stated task directions will help your students complete a biography research project independently. 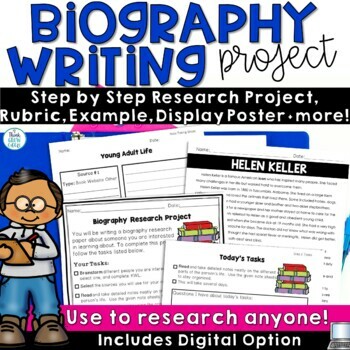 This pack includes everything you need to help your students write a biography research project. Directions are clear and easy to understand and come in two layouts for students to either work at their own pace or work as a class step by step. Note taking sheets and organizers help students to record information they learn from the sources they are using, as well as, gain a deeper understanding of the person they are researching. This pack can be easily infused into any writing program. See the preview for more specific details! NOTE: There are no biography articles in this resource. For students to complete the research, you will need to provide them with books or websites. This pack contains reproducibles to help them gather and organize information into a research project. "I do a biography project each year with my third graders. They used the note pages this year while reading. Our papers are the best in years!" "You have saved me soooo much time. This is exactly what I have been looking for. I will use this with my second graders tomorrow, as they conduct research for Black History Month. Thank you so much! Superb!!" "Well thought out. Thorough. Helpful resource. Thank you." Need More Writing Activities? Check out my other products!